Beidh an Club Ficheall ag tosnú arís tráthnóna Dé Luain 27/03/2017 (2.30 - 3.30 p.m.). Beidh costas €5 le haghaidh trealamh agus duaiseanna. Fáilte roimh cách, Rang 1 ar aghaidh. 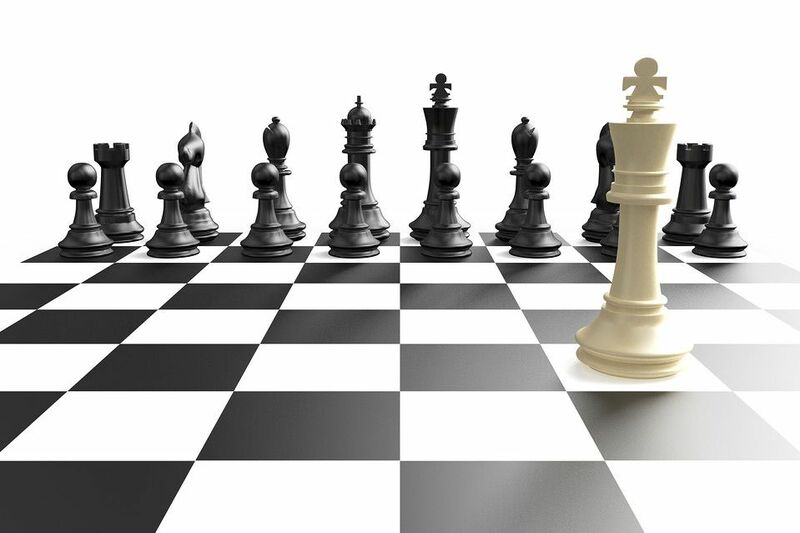 The Chess Club will recommence this Monday 27/03/2017 (2.30 - 3.30 p.m.). There will be a €5 cost per child for equipment and prizes. Everyone is welcome from 1st Class upwards. Ghlac Oscar Ó Laoi páirt in Eason Spelling Bee in Óstán Baile an Róistigh inné 22/03/17 ar son Ghaelscoil Chionn tSáile. D'éirigh go h-iontach leis. Árd-fhear! 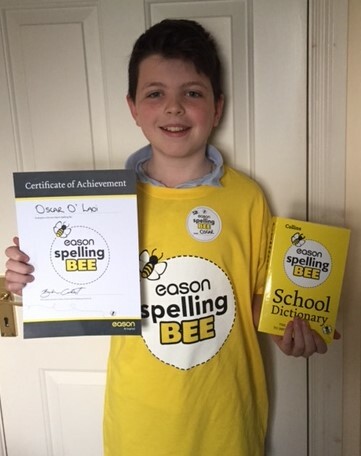 Oscar Ó Laoi represented Gaelscoil Chionn tSáile in this year's Eason Spelling Bee competition, held in Rochestown Park hotel yesterday 22/03/17. He was t-e-r-r-i-f-i-c!!!! 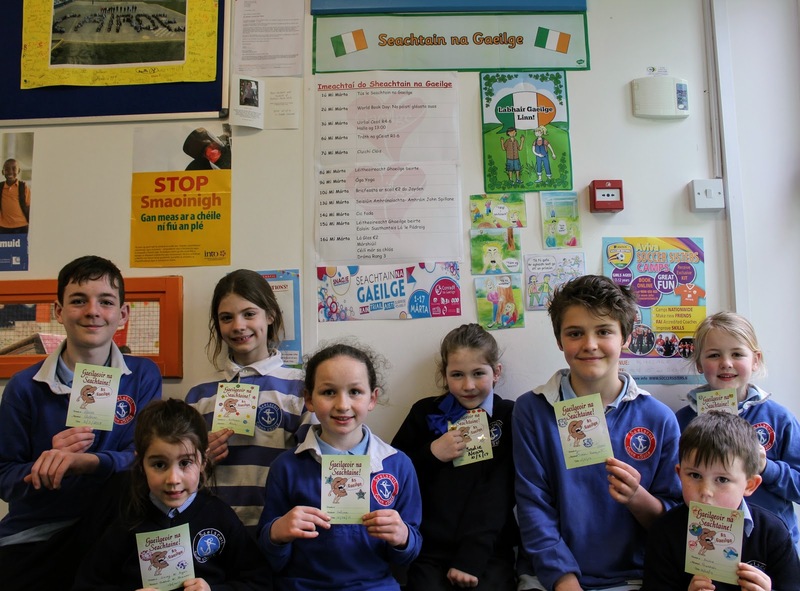 Cuirfidh rang a 3 an dráma 'Póilín Piongain is a Cairde' i láthair do thuismitheoirí na bpáistí rang a 3 ar an Aoine seo 24/3/2017 ar scoil ag 2:00in. Rang a 3 will perform their drama 'Póilín Piongain is a Cairde' in school at 2:00pm for the parents of rang 3 on Friday 24/3/2017. Beidh banna ceoil na scoile ag seinm sa Chór Fhéile i Halla na Cathrach ar an 30ú Márta 2017 ag a 7 a chlog. Tá fáilte roimh cách teacht chun tacaíocht a thabhairt dúinn. Táimid ag súil go mór leis! The banna ceoil will be playing in the Cór Fhéile in City Hall on the 30th March 2017 at 7 o clock. All are welcome to attend. We're really looking forward to it! Beidh mé ag dul chuig an siopa Comhlucht an Naomh Uinsinn de Pól ar an Déardaoin beag seo, 16/03/2017, leis na héadaí sa bhosca caillte agus faighte. Cliceáil ar an nasc thíos chun iad a fheiscint. Má's leatsa aon rud beidh tú in ann é a fháil san oifig roimh an Déardaoin. I will be bringing the contents of the Lost and Found box to the St. Vincent de Paul shop this Thursday, 16/03/2017. To see what's in the box, click on the link below. If any of the items are yours, they can be collected at the office before Thursday. 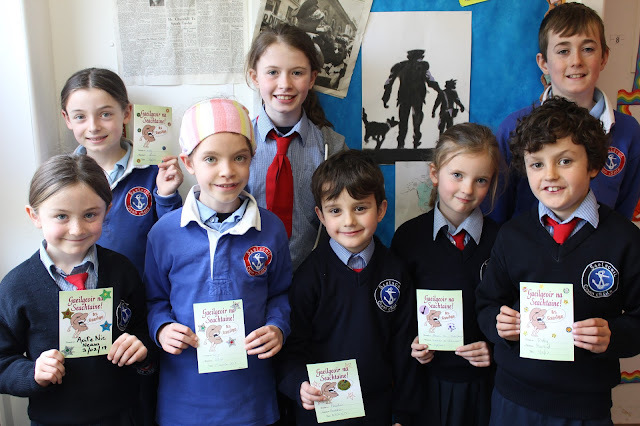 Beidh an Fhoireann HSE - vaicsíniú anseo sa scoil i gcóir Naíonáin Shóisireacha ar an Máirt, an 23ú Bealtaine 2017. The HSE Vaccination Team will be here at school for Junior Infants vaccinations on Tuesday, 23rd May 2017. Beidh Aifreann don gCóineartú ar siúl ar an Domhnach seo chugainn, 12/03/2017. 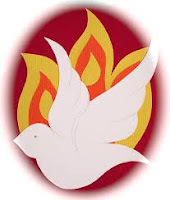 The next confirmation mass will take place next Sunday, 12/03/2017. Beidh teist súl Naíonáin Shóisearacha ar siúl ar an gCéadaoin 8ú Márta 2017 ar scoil. Junior Infants eye test will be on the 8th March 2017 at school. Mar chuid de chéiliuradh Seachtain na Gaeilge tá sé ar intinn againn bricfeasta a bheith againn ar scoil Dé hAoine seo chugainn, an 10ú Márta 2017. 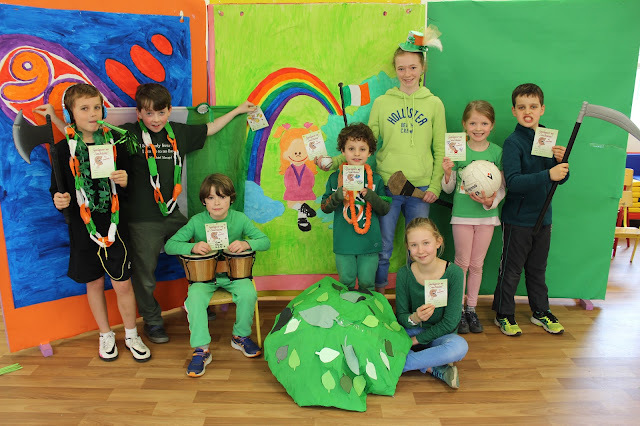 An rud a deineadh gach bliain eile ná go dtógfadh na páistí a rogha arbhair bricfeasta ar scoil le babhla agus spúnóg agus go mbeadh an bainne ar fáil anseo ar scoil. Bíonn sé de nós againn €2 a lorg ó gach pháiste ar an lá seo agus ceannaíonn an scoil rud eigin deas leis an airgead san nó cabhraímíd le carthanacht éigin leis an airgead san. I mbliana ta sé i gceist againn an airgead a thabhairt do charthanacht atá ag cabhrú le páiste a bheidh ag freastal ar ár scoil an bhliain seo chugainn, Jayden Fuiréast, go bhfuil Cerebral Palsy air. Seans go bhfuil postaeirí feiscithe agaibh timpeall an bhaile mar gheall ar iarrachtaí eile a bhíonn ar siúl dó. 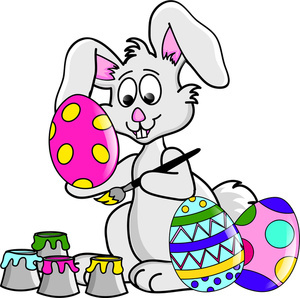 As part of our Seachtain na Gaeilge activities we will be hosting a "Bricfeasta ar scoil" on Friday the 10th March 2017. What we have done every other year is the children bring their chosen breakfast cereal, along with a bowl and spoon and we provide the milk. 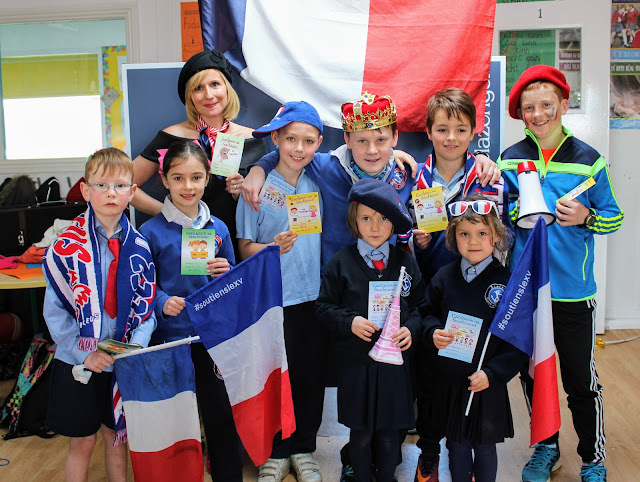 We ask that the children bring in €2 each and normally the school buys something extra with this money or else we donate it to a worthy charitable cause. This year we would like to done the proceeds to a charity associated with a boy who plans to attend this school in September '17, Jayden Forrest, who has Cerebral Palsy. Every chance you've seen various fundraising campaigns for him around the town. Tá go leoir éadaí fágtha ar scoil le déanaí. Chun iad a fheiscint cliceáil ar an nasc thíos. 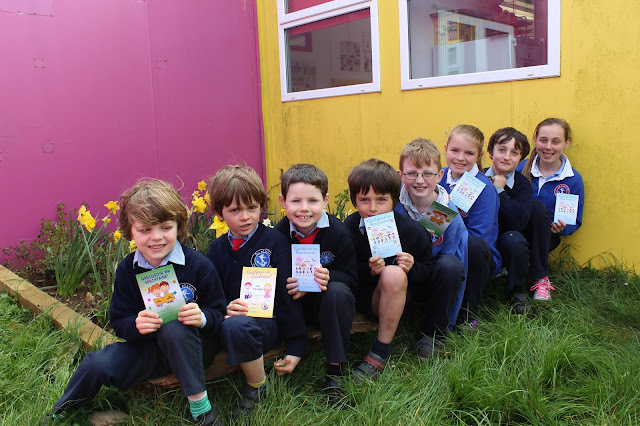 Is féidir aon rud a bhailiú in oifig na scoile má's leats é. There have been a lot of clothes left at the school recently. To view them, you can click on the link below. If anything is yours you can collect it at the school office.